As far as houseplants go, yucca probably eclipsed by the similar-looking Dracaena genus, which is often mistaken for yucca. They are, however, interesting and slow-growing houseplants that have the added benefit of being extremely drought tolerant. If you kill a yucca, it's probably due to overwatering. Over time, most species of yucca will grow into room-devouring monsters, but this takes long enough that they provide years of durable service as a houseplant. Under the right conditions, yucca is not difficult to grow. They tend to thrive on a little neglect, rather than too much attention. They are especially easy to overwater, and soggy stems are a sign of too much water. 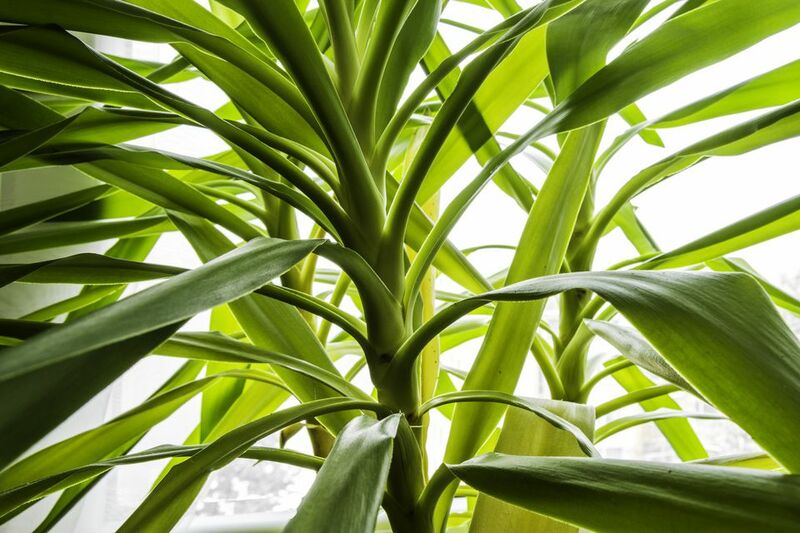 The best conditions for Yucca include a sunny corner with relatively low humidity. Yucca is not prone to many pests, although scale can be an issue. Over time, yucca plants will typically lose their lower leaves (in nature, they droop, forming a skirt around the trunk), giving the plant a pleasant "tree-like" appearance. Yucca thrives in full sunlight, so they're perfect for that west-facing window where everything else burns up. They also do well in bright, indirect sun. Growing yucca in low light will lead to fewer flowers and thinner growth for the plant. Yucca naturally grows in sandy, dry deserts. Inside, though, plant the yucca in a loose, well-drained potting mix. The potting mix doesn't need to be specially formulated or rich; in fact, this isn't a good idea for low-maintenance yuccas. Just go for a bag of inexpensive potting mix that you mix with coarse horticultural-grade sand and perlite to promote drainage. Yucca is highly sensitive to water-logging. Water regularly in the spring and summer growing season, but make sure the plant has excellent drainage and dries between waterings. Water sporadically in the winter. Never let a yucca plant sit in a tray of water. Yucca is adapted to the desert, where temperatures can soar into the 90s or higher and down into the 30s at night. Fertilize during the growing season with liquid fertilizer or controlled-release fertilizer according to label instructions. Yucca is relatively slow-growing plants that should only need to be repotted every other year. They do well slightly pot-bound, as long as they don't become heavy enough to tip over their containers. Repotting larger yucca plants can be difficult, so larger plants can be refreshed with new potting soil by digging out the top two inches of the container and adding new soil. During typical repotting, remove the yucca plant from its container and go up one container size. Always use fresh potting soil. The easiest way to propagate yucca is with offsets of older plants. Divide the plant during repotting or carefully slice away the offset and pot up into a separate container. They can also be propagated by stem cuttings, using pieces of stem measuring at least 4 inches and rooting hormone. Yucca grown indoors will likely not flower or bear seeds. Y. aloifolia. Sometimes called the Spanish bayonet, this plant features stiff leaves that end in sharp points. Leaves up to 20" long and can be dangerously sharp. According to the SPCA, yucca is toxic to dogs, cats, and horses because of the saponins it contains. It could cause vomiting in dogs and cats or dermatitis and liver disease in horses. Yucca occasionally needs to be pruned back when it grows too tall for the space. Remove the plant gently from its pot and use a saw or sharp pair of loppers to cut the trunk in half. Repot the rooted end of the trunk, and water it well. If you want to prune the flowers of a yucca, you can do so at any time, even if it's not blooming. Use a sharp pair of pruning shears to cut the stalk off 3 to 4 inches above where the stalk grows from the main trunk.